Have you caught on to the new smoothie fad lately? Instead of in a cup, it’s in a bowl! But that’s not all, they also happen to be even more nutritious than regular smoothies because you can add any number of favorite toppings without having to drink a chunky smoothie. You simply eat them with a spoon as you would a bowl of cereal, except these beat your morning bowl of cereal by a long shot in the amount of nutrition they provide. They’re called smoothie bowls my friends, and I’m hooked! Sometimes I don’t want to drink my breakfast. Sometimes I want to experience some texture or just some crunch to satisfy my hunger and smoothie bowls do not disappoint. You can add anything you want to them and use any base for them you like. They’re also really simple to make and some recipe can even be made over night (my favorite kind!). I’m not sure where I came across my first smoothie bowl recipe, but I knew when I saw it that this was exactly what I had been looking for. You can really fit a ton of stuff in them, and I love that you can distinctly experience different flavors on their own. Have you ever made a traditional smoothie and found that you could hardly taste the ingredient you were going for? Disappointing to say the least, and now you have to drink the whole thing; bland taste, wasted money, and sad feelings. 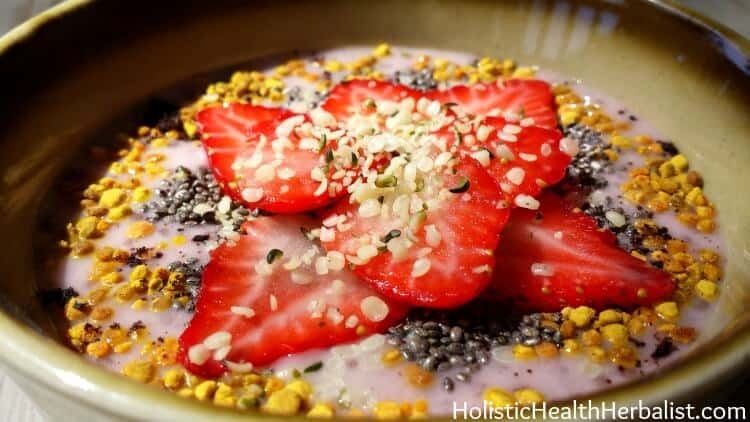 Today I want to share a very simple smoothie bowl recipe that anyone can make. You don’t even need a blender for this one! Chia seeds make a fantastic base for smoothie bowls because you don’t need to blend them to get a nice thick texture. They gel up in whatever liquid you put them in and voila! Thick smoothie goodness. Nut/coconut milk also provides a tasty flavor to any smoothie. I like to soak my chia seeds in either freshly made almond milk or full fat coconut milk for extra creaminess. You can learn how to make nut milk below! If you don’t have the nuts, try blending nut butter with coconut milk. It tastes amazing! For toppings you can use anything you like. I like to use various superfoods and superfood powders, chopped fresh/dried fruit, nuts, and honey. The list goes on and on! So have fun with it. Alright, enough with the suggestions! Here’s the recipe! After an hour the mixture should be nice and thick. If you want it thicker, add another TB of chia seeds, shake it up, and let it sit in the fridge for another 20-30 minutes. Pour the mix into a nice bowl and decorate with your favorite toppings. 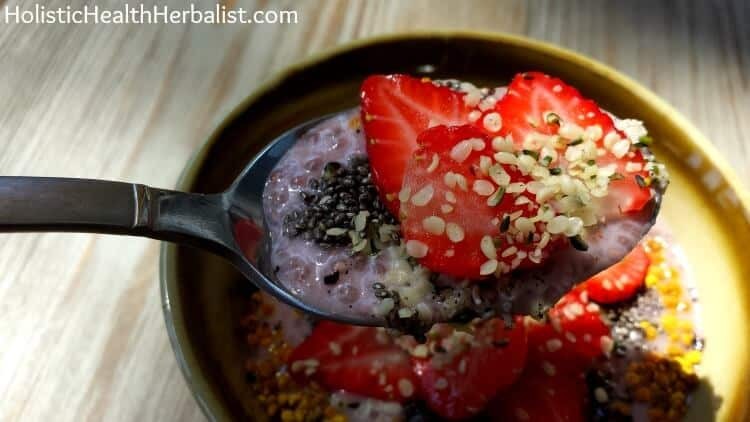 I used a sprinkling of hemp seeds, bee pollen, acai powder, strawberries, and chia seeds. [yumprint-recipe id=’30’]Where can I find more smoothie bowl recipes? Check out the links below!